BARmax, unlike other courses available, has mastered studying on the go. Life is hectic and everyone is juggling 20 things at once, and that’s why you need a course that is going to keep up with all you have to do. No matter what device you use, laptop or smartphone, you are able to pick up quick study sessions anywhere with BARmax. This medallion signifies that BARmax has gone above and beyond to create a course that will help you pass the Bar exam so you can start practicing law in your given jurisdiction. 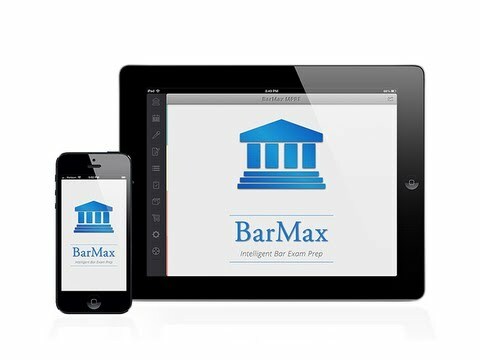 If you’re simply looking for the best Bar prep course to help you pass, BarMax is your best bet! Many courses are “mobile optimized” but really have limited functionality on a smaller screen. BarMax is one of the best on-the-go study courses and it is available at a much lower price than some of its competitors. Despite the relatively low cost, there’s a lot of value for this review course, as it is comprehensive and comes with great planning tools. BarMax is a great Bar review course and will get you to the promised land even if you’re constantly on the move. The BarMax online prep course gives you the ability to carry all the information you need around in your pocket. Having access to stacks of books through the app makes this course the easiest to use on the fly or whenever you have a spare moment to study. Studying for the bar exam is almost fun when you can do it on your iPhone or iPad at the coffee shop, gym, or beach. Internet access is not required to access content through the BarMax app, and you don’t have to waste time driving to class. At $1499, BarMax Bar Exam Review’s comprehensive state course price is much lower than the industry average. The price includes lifetime access to audio lectures from Harvard Law alumni, such as the legendary Arthur Miller, corresponding black-letter law outlines, and flashcards. There’s more than 1,750 real multiple-choice questions (MBEs), real practice essays, real performance test (PT) questions, personalized writing revisions, analytics and customer support by phone, email and in-app message boards. This is an incredible value. BarMax also offers 0% financing, which allows you to get immediate access to any BarMax course and split the purchase into budget friendly 3, 6 or 12 monthly payments. BarMax also offers a public interest discount for students pursuing careers in public interest law. In addition to the comprehensive state courses, Bar Max offers supplements for the MBE portion. The MBE full course is $699.99 (audio lectures, outlines, flashcards and over 1500 MBE questions), while the question bank is $349.99. BarMax provides a recommended study calendar that sets forth daily assignments and a clear overview of the material, including how much you will need to study. The calendar suggests a more reasonable study plan of 15-25 hours per week for 12 weeks. This efficiency is unparalleled. Additionally, since BarMax is the only bar review course to offer instant and lifetime access, it is an amazing option for students who would like to get started with bar prep sooner—a great idea if you are working full-time or are an international student. This course is especially suited for students who may be overwhelmed by the massive information overload that is typical in other review courses. Straightforward outlines and easy-to-understand lectures along with actual multiple-choice questions (MBEs) from previous bar exams, as well as flashcards and practice essays make this program less complex and more effective. BarMax currently offers preparation for the bar exam in California (CA), Uniform Bar Exam (UBE)—currently used in 33 jurisdictions, including New York—the Multistate Bar Exam (MBE), the CA First Year Law Students Exam (FLYSE or Baby Bar) and the MPRE (free). Additional for-fee options include remote tutoring by phone/online, additional essay and PT critiques, and notebooks for those who prefer to study with hard copy and print materials.